I’m aware this is another courgette recipe. What can I say? We’re overwhelmed, not only are we getting them from our vegbox but the marrows are also threatening to take over at the allotment we’re babysitting. Having said that, it’s amazing what the pressure to use up a couple of huuuge marrows can do, I’ve come up with some genuinely delicious and different ways to cook courgettes, my favourite is still this soup, we made a huge batch out of the marrows. This recipe is another gem, from none other than Cranks , I always forget just how good this book is, full of delicious and unique vegetarian recipes. It has guided me through budding vegetarianism and fed my friends and I through university. 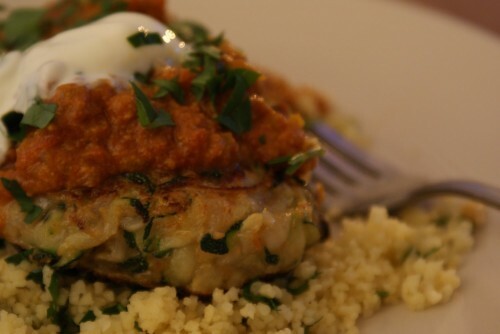 These are crisp, delicate, gnocchi-esque fritters, eaten with a spicy tomato and almond sauce, couscous and yoghurt. I made the tomato sauce the day before in about 10mins and then made the fritters on the day. Cranks suggests making little balls and deep frying them. We went the lazy route and shaped larger fritters that we shallow fried. However, next time I think I will go all out and deep fry them (and I include instructions to do that below) – the crispy edges are just so good. Make the tomato and almond sauce first, it benefits from sitting around for a while letting the flavours develop. Heat a large saucepan with a splash of oil. Fry the onions, ginger and chilli for 5 or so mins. Add the spices and fry for a few mins more. Add in the chopped tomatoes and ground almonds. Simmer for 15-20mins until thick and season well. Now pour the oil into a deep saucepan – you want it to be about 10–12cm deep – and heat it to 180°C. To check, just drop a piece of bread into the oil, if it floats and starts to sizzle immediately, it’s ready. Flour your hands and shape a tablespoon of mixture at a time into small balls. Carefully place into the hot oil. Fry the pieces gently, turning them a couple of times with a slotted spoon. When they’re browned and crisp, lift them out of the oil, allowing any excess to drip back into the pan, and drain on kitchen paper. 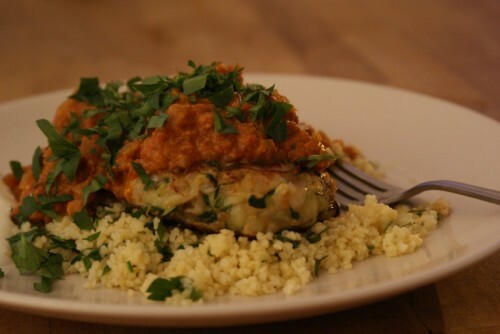 Serve on a mound of couscous with a spoonful of the sauce, a dollop of yoghurt and a sprinkling of coriander. I've been given so many courgettes lately by people who grow their own vegetables, it's not true! This looks good and should come in handy when the next bag arrives! I too have been given courgettes by friends and family and so have made a few of your fab courgette based recipes of late. I made this one tonight and it was so delicious! Thanks for passing on the recipe – destined to become a favourite around here. I love the sound of this particulary the almond and tomato sauce. I have just been in sicily where they use almonds beautifully and not just for sweet delights but often in sauces for with with swordfish or vegetables or to be tossed with pasta….. so this is really lovely timing.